Here's the thing. I really dislike spoilers. Really really. Which means that I try to stay away from anything spoilery as much as is humanly possible. Oh, it's fun! And I'm humming the theme tune already and LATERS! and, my, that is a lot of clavicle. And now I'm trying to work out who would win in a fight between Sherlock Holmes and Sarah Lund and I honestly don't know. All I know is that I kind of want one of Lund's jumpers because then I could feel like a tough, no-nonsense, slightly-unhinged police lady. And the countdown to Christmas begins! I feel like I really need a Christmas holiday this year. Work has been fairly stressful recently and home-life has been a little stressful too, so I think I need some time to wind down. On a positive note, writing these advent drabbles has been so much fun (for me, at least, maybe not for you :D) even if somedays it takes me a while to work out what to write. Currently, I'm looking at today's prompt and making a :/ face. 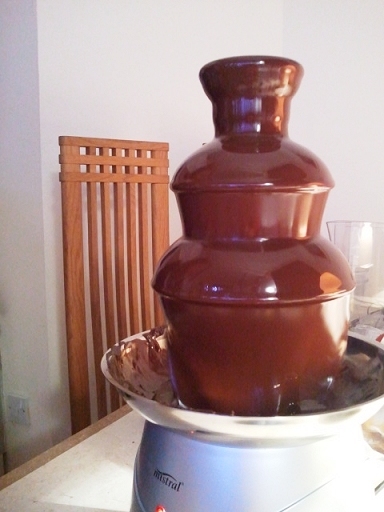 Also, last weekend, I went to visit Deborah and we tried out her new chocolate fountain! 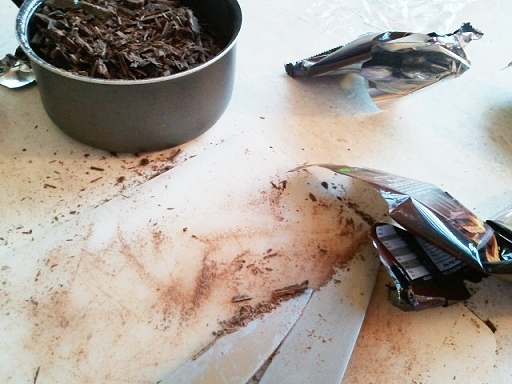 Chop chop chop then melty melty. Oddly enough, it doesn't taste as great as it looks, but it is ridiculous amounts of fun. That is, until you've both eaten far too much and have to lie on the sofa groaning. Good times. I hope you're all having good pre-Christmas weeks! I always prefer the build-up to Christmas to the big day itself. And don't listen to too much Slade, now, will you? It's not good for you in large quantities but can be enjoyable as part of a varied diet. So the new series of Sherlock starts on 1st January. Oh, what to do? I'm clearly going to have to consider my NYE plans carefully this year.